The Wizards made a trade to add a talented big man to our roster Friday night — and Marcin Gortat will contribute right away to our team. It was important to our franchise to enter this season at full strength and to have depth and show upside and improvement. Lots here. Yep, Gortat is talented, and he will contribute immediately. Part of that is because the other guys on the roster at power forward and center are so awful. More on that in a moment. That second sentence is one of those that make me wonder if he’s being careless with words or whether he’s really that cynical about fans of his team. In sports-speak, “upside” means potential and “depth” means having more than one good player at a position. Maybe I’m just THAT stupid, but I can’t figure out how trading for a 29-year old center on a one-year contract can count as “upside.” If Gortat does his job, the team will likely get to the playoffs, which won’t mean much unless they re-sign him, which they really don’t want to do because of Leonsis’ previous chest-thumping about signing a “brand name” free agent. His “depth” comment is a face palm moment. Why wasn’t frontcourt depth important to “show” during the summer? With a solid small forward on the roster for another year (Trevor Ariza) and two more swingmen joining the team through the draft (Otto Porter and Glen Rice Jr.), why spend the mid-level exception on yet another SF (Martell Webster)? With an acceptable backup point guard easily re-signed for the league minimum (A.J. Price), why rush out the first day of free agency and burn the bi-annual exception on a scrub (Eric Maynor)? As for that “improvement” thing — it’s kinda hard to know what he means. Does he mean the team’s record? If so, then I’d sort of agree. The team should win more games this season. It could be an illusory improvement, however because Gortat and Ariza are on expiring contracts and could depart whether the Wizards want to re-sign them or not. Plus, as mentioned above, Leonsis is hoping to attract a free agent — something that can’t happen if the team re-signs Gortat and/or Ariza. We traded a protected first round pick to get the deal done. We have many young players on our team today and we believed that using our conditional pick to get the deal done was the prudent move for our franchise at this time in its development. Of our 15 players under contract 8 players have been drafted by us in the first or second round in the last 4 off seasons. We are a very young team still. We have noted that we would use the draft, first and foremost, to rebuild our team. 8 players and make trades to bring on vets such as Trevor Ariza, Nene, and now Gortat — or free agency such as Martell Webster, Eric Maynor and Al Harrington. We dipped into the D league for Garrett Temple. This kind of claptrap has me leaning more toward the conclusion that Leonsis is being cynical. Leonsis is suggesting that the team is actually building through the draft and that they’re just bringing in a few veterans here and there to kinda supplement these wonderful young players, who dangit arejust too young to carry the burden themselves. 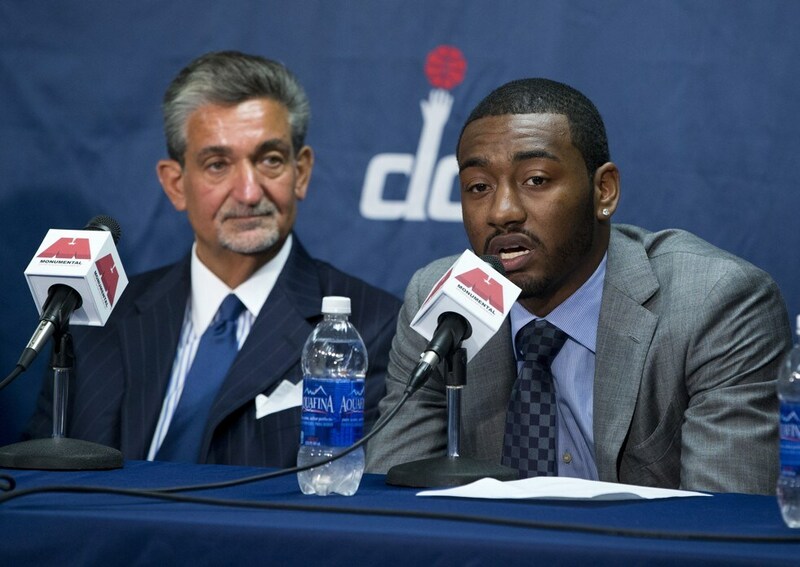 John Wall — Consensus number one overall pick. Woefully inefficient on offense throughout his career (terrible shooting and lots of turnovers). Had a month last season where he played like a potential league MVP candidate. While he received a maximum salary contract extension, Wall has been more potential than production through his first three seasons. Bradley Beal — Third overall pick last season. Struggled at first, but played at a borderline All-Star level for a stretch until he had to sit due to a leg injury. His rookie season statistically looked a lot like Ray Allen’s. Otto Porter — This year’s third overall pick has been injured. In my pre-draft analysis machine “YODA,” Porter rated as a top five pick in most drafts. When he was selected, Cody Zeller and Nerlens Noel rated as better prospects. Porter should be a good pro, however. Glen Rice Jr. — The team trade two second round picks for the second round pick they used on Rice. His amateur/minor league career has been…interesting. He rated poorly as a draft prospect in college, but played well in the D-League last season. If he’d done in the NCAA what he did in the D-League, he’d have rated as a mid-first round pick. Assuming his off-court baggage is abandoned, he could make for a solid reserve SG/SF. Trevor Booker — The team made a draft-day trade to acquire him three years ago. The big issue with Booker: health. He’s been solidly productive when he’s played, but he’s missed substantial time due to a series of injuries. Kevin Seraphin — Obtained in a 2010 draft-day trade, Seraphin’s awful play was a big reason why the team had to trade a future first round pick to get a good player at center when Okafor got hurt. Last season, he was the league’s least productive center (minimum 500 minutes). Jan Vesely — Chosen sixth overall, Vesely has been an abject disaster. While Vesely has been awful, others chosen later (like Kawhi Leonard, Nikola Vucevic and Kenneth Faried) have thrived. In my analyis, Vesely last season rated as the league’s least productive power foward (minimum 500 minutes). Chris Singleton — Chosen 18th in the same draft that brought the Wizards Vesely, the team’s braintrust picked Singleton over Faried, Reggie Jackson, Jimmy Butler and Chandler Parsons. This was not a good decision. Singleton has been almost as bad as Vesely. Last season, he rated as the league’s second least productive power forward (ahead of only Vesely). So, to recap, these young building blocks include a potentially good PG, a potentially good SG, a potentially good SF, a probable rotation swingman, a decent rotation PF, and three of the worst basketball players in the league. And oh yeah, Booker and Seraphin are on expiring contracts, and the team just declined to pick up the fourth year options on Vesely and Singleton. In other words, half of these eight draft picks that make this team so young, will likely be gone after the season. In effect, the team already released Vesely and Singleton. And, any money they spend re-signing Booker or Seraphin would cut into their salary cap space, which would hinder their pursuit of a “brand name” free agent. Here are some additional clips regarding the trade.Check them out here,here,here, and here. Shocking that he didn’t include my analysis.